Wind power could provide more than a third of the nation's electricity by 2050. That is the bold projection from the U.S. Department of Energy's analysis of America's wind energy industry, released Thursday. "We can do this and save you money by doing it," Tom Kiernan, CEO of the American Wind Energy Association, said in response to the report. "This definitive report provides the wind industry with aggressive targets for the growth of wind energy in America, and we stand ready to meet them," he said. "It starts with getting common-sense policies in place, so we can double U.S. wind energy in the next five years." Already ranking first worldwide in wind power generation, the report found that the United States has increased the amount of electricity it gets from wind threefold since President Obama took office and predicts that further grown could go a long way toward combating climate change by taking a bite out of global greenhouse gas emissions. But make no mistake, wind turbines will not replace coal-fired power plants overnight. 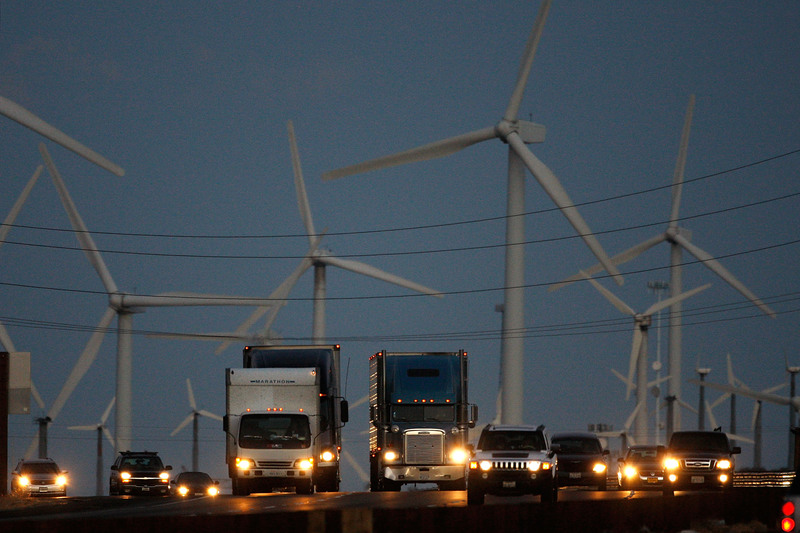 While it has grown, wind still only provides 4.5 percent of electricity in the United States. The report projects wind generation will reach 10 percent by 2020, 20 percent by 2030 and 35 percent by 2050. And while wind wouldn't be competitive without incentives, the report projects the cost of new wind power generation will be below the national average of new and existing fossil fuel plants within the next decade. "With continued investments in technology innovation, coupled with a transmission system that can provide access to high resource sites and facilitate grid integration reliably and cost-effectively, the scenario is an ambitious yet viable deployment scenario," the report said of the projections. Still, not everyone appears to buy into the rosy projections. Sen. Lamar Alexander, a Republican from Tennessee, said America would be better off increasing its dependence on nuclear power which already produces 20 percent of electricity and 60 percent of "our clean energy." "Relying on windmills to produce that electricity when nuclear power is available is the energy equivalent of going to war in sailboats when nuclear ships are available," he said in a statement. "After 22 years of billions of dollars in subsidies, wind still produces only 4 percent of our electricity and the windmills work only about 30 percent of the time." Until now, the growth of wind has been driven by federal investments and tax credits - which recently expired - that offered 2.3 cents for each kilowatt hour of power generated. In the future, it should also benefit from the Environmental Protection Agency's Clean Power Plan. It calls for states to cut the amount of electricity generated from coal at least 30 percent by 2030, replacing it with renewables like wind and other cleaner sources of energy as part of an effort to reduce the country's emissions 26 to 28 percent by 2025. The report found that wind's expansion doesn't depend on "disruptive technology" like that of other renewables. But it does rely on more efficient systems including taller towers to take advantage of higher wind speeds, overall plant efficiency improvements through advanced controls and "improved plant designs enabled by deepened understanding of atmospheric physics." Without continued innovation, the report warned, the United States would lose its position as a leader of wind power. It could also miss out on a range of environmental and health benefits, the report found, including the ability to avoid 12.3 billion tons of carbon emissions by 2050 or about a third of the global emissions produced annually, as well as $108 billion saved and 21,700 premature deaths avoided due to cleaner air.